Rip! 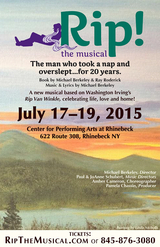 The Musical will be on stage at the Center for Performing Arts at Rhinebeck on July 17, 18 and 19, 2015. 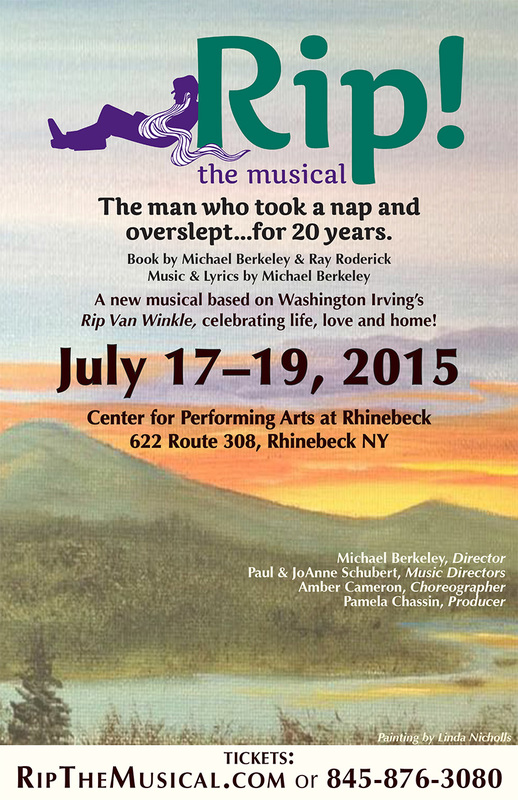 Tickets available online by clicking here or calling 845-876-3080. The upcoming production at the Center, sponsored by Hammertown, features Jarek Zabczynski as Rip Van Winkle, Lori J. Belter as Dame Van Winkle, Lou Trapani as Peter Vanderdonk, and Lisa Lynds as Gertrude Lindemulder. The cast of 30 also also includes audience favorites Michael Britt, Amy LeBlanc, Meric Martin, Melissa Matthews and Frank McGinnis. Click here for the complete cast list. Michael Berkeley directs, with choreography by Amber Cameron and music direction by Paul and JoAnne Schubert. The musical is designed by Bill Ross, costumes by Lobsang Camacho, lighting by Dave Popieluszko, sound by Natalie Houle; props by Judi Moore and Nina Mathus; Patrick McGriff is stage manager and Pamela Chassin is producer. With only four performances over the weekend of July 17-19, tickets are limited. Please click here or call 845-876-3080 to purchase tickets. For an online dining guide to the many excellent restaurants in the area for pre- or post-theatre dining, click here. ©2014 HMS Productions, Inc. All Rights Reserved.